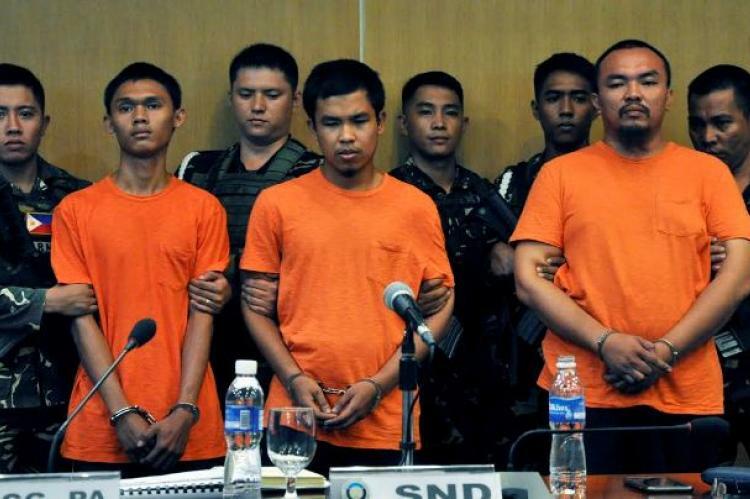 The Department of National Defense presented the three suspects in the Davao City night market bombing who they arrested in Cotabato City on Thursday. The three men were arrested as they attempted to evade a mobile checkpoint while riding on motorcycles without proper licence plates. All three men are known members of the notorious gang Maute Group which has a close relationship with Abu Sayyaf. Arrested were TJ Tagadaya Makabalang, Wendel Apostol Facturan, and Musalli Mustapha. DND officials said the three men are directly associated with the September 2 bombing in Davao City and say they have solid pieces of evidence to prove they are the men who planned and implemented the bombing attack. A report on the suspects showed they are part of a newly established cell of the Maute Group in the region of Cotabato City – the men are said to be trained by Jemaah Islamiyah operative, Zulkifli bin Hir, an Indonesian who used the alias of Marwan. Marwan was killed in January of 2015 in Mamsapano, Maguindanao. Officials said the three men were taught by Marwan and were all his former students. When Marwan was killed the three men took over making IEDs and spreading his propaganda. Macabalang is said to be the person who detonated the improvised bomb, while Facturan was the one who placed the explosive. It was Mustapha who took a video of the incident using a cellular phone. The cell phone used by Mustapha was recovered from the scene of the arrest. The same phone also contained a short video showing Facturan with an ISIS flag and a photo showing a bomb manual. Authorities believe that at least 10 others participated in the night market bombing. Officially the three had a standing warrant of arrest in other criminal cases and were unofficially known to have been part of the Davao night market bombing – local media said otherwise, but the truth stands. Recovered from the suspects at the time of their arrest were the known cell phone that gave authorities the lead to the Davao bombing – also recovered was a .45 cal. pistol, bomb making materials and a machine gun. Police early Friday morning raided the home of TJ Macabalang’s father, Teng Macabalang who was arrested in Cotabato City on virtue of a search warrant – recovered in that raid were assorted firearms, ammunition and bomb components.